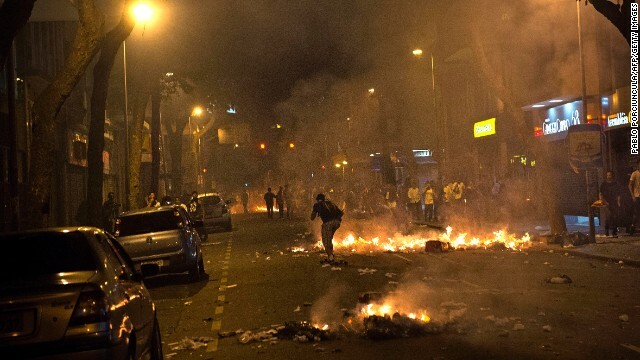 They chant "Down with corruption" and "I can live without the World Cup"
Are you witnessing the protests in Brazil? Share your images and videos with CNN iReport. 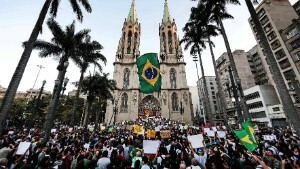 Rio de Janeiro (CNN) -- A massive crowd of demonstrators swelled around an iconic church in the heart of Rio de Janeiro on Thursday, shouting "down with corruption" and "I can live without the World Cup." 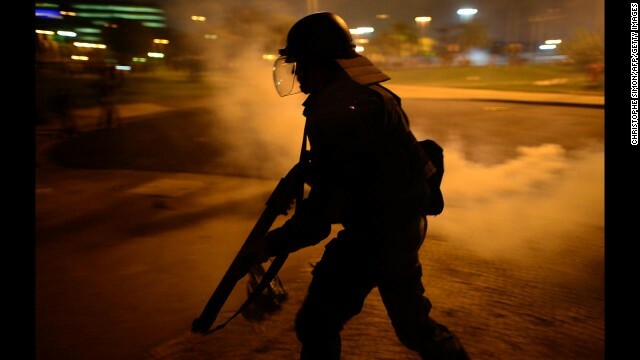 CNN affiliate Band News reported that police used tear gas in some areas of the city as clashes erupted. Police initially reported tens of thousands of protesters in Rio de Janeiro but later said the crowds had grown to more than 300,000 people. One death was reported in Sao Paulo state, where a young man was run over by an SUV at an intersection during a demonstration, state police said. Outside the Candelaria Church, organizers called for protesters to march peacefully as they listed a wide variety of demands directed at the South American country's government. 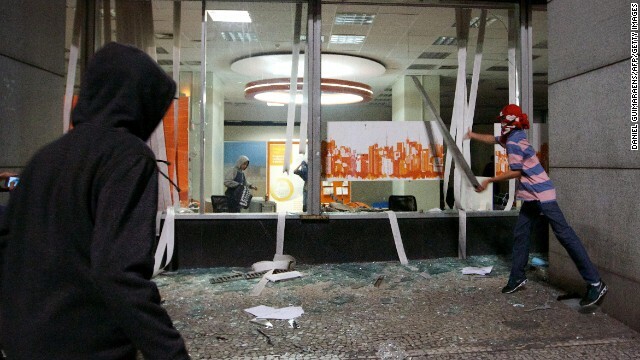 In the nation's capital, a group of protesters on Thursday twice forced their way into the foreign ministry building. 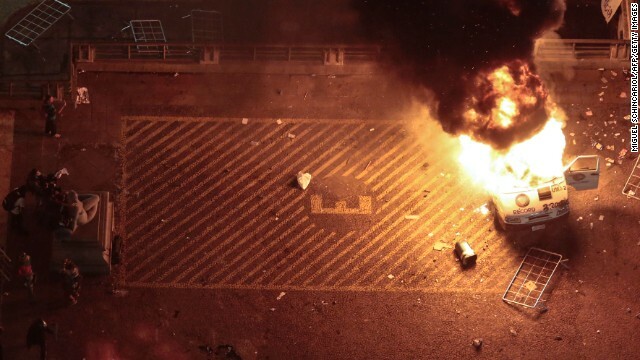 Police repelled both incursions, but not before protesters lit a fire inside the building, state media reported. 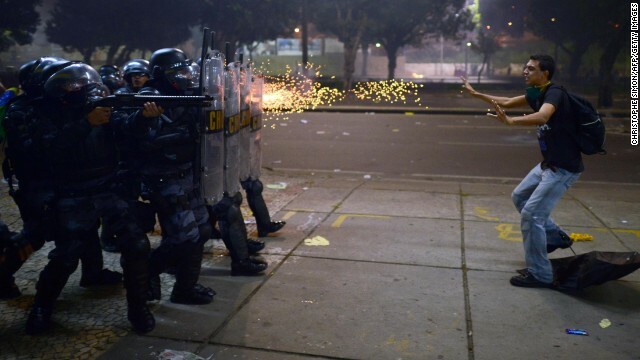 Police fire rubber bullets at a protester during clashes in Rio de Janeiro on Thursday, June 20. Demonstrations in Brazil began in response to plans to increase fares for the public transportation system but have broadened into wider protests over economic and social issues. Since then, both Sao Paulo and Rio de Janeiro have agreed to roll back prices on bus and metro tickets. 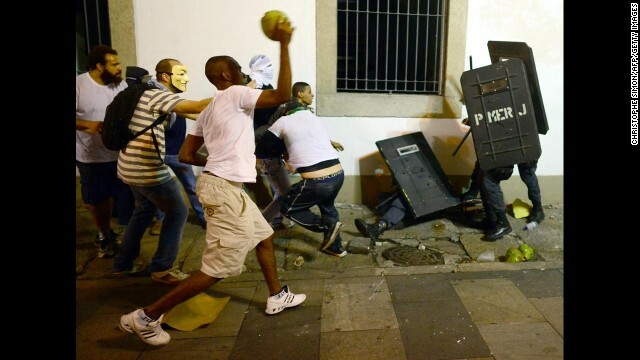 A riot police officer confronts demonstrators in Rio de Janeiro on June 20. 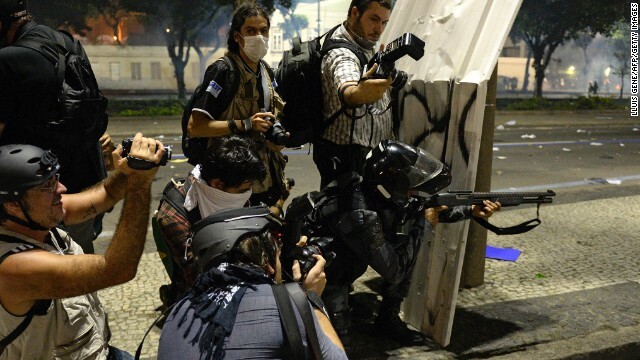 Photographers wait for a riot police officer to fire rubber bullets on June 20 in Rio de Janeiro. 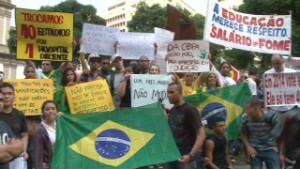 Brazilians protest against price hikes in Belo Horizonte on June 20. 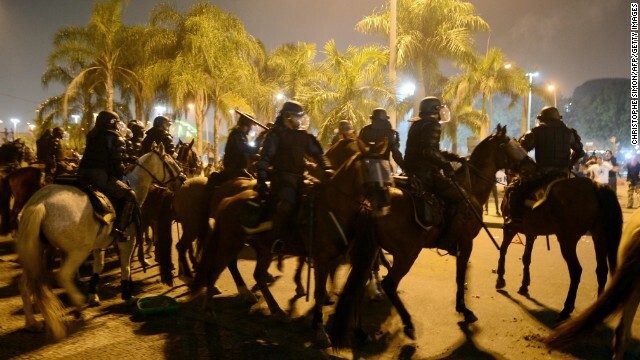 Horse-mounted riot police confront demonstrators in Rio de Janeiro on June 20. Demonstrators stand on a statue in Niteroi outside Rio de Janeiro on Wednesday, June 19. 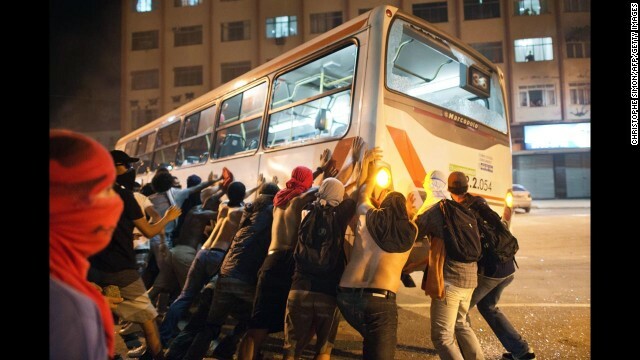 Protesters overturn a bus in Niteroi on June 19. Riot police take positions during a protest in Sao Paulo on Tuesday, June 18. Hidden in the peaceful multitudes are bands of rowdies, leaving rubble in their wake, including this store in Sao Paulo on June 18. 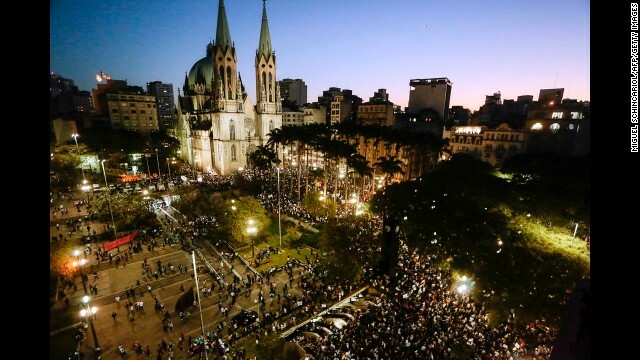 Students gather at Praca da Se in Sao Paulo on June 18. 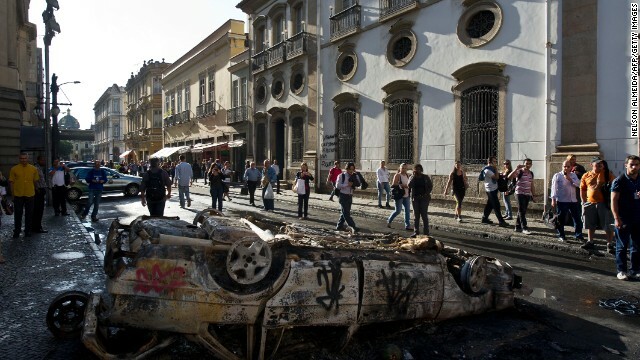 A press car burns in front of Sao Paulo City Hall on June 18. 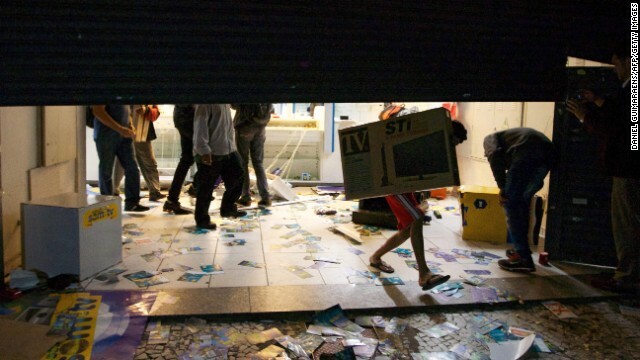 An unidentified person carries a television out of a store in Sao Paulo on June 18. People walk in Rio de Janeiro on June 18. 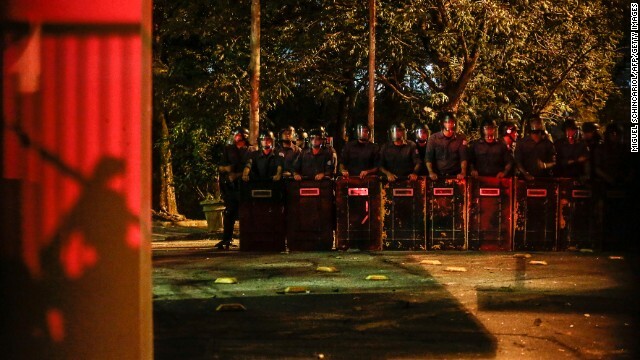 Riot police form a line outside the Government Palace in Sao Paulo, on Monday, June 17. 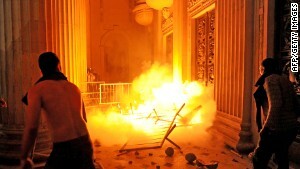 Protesters set a fire outside the Tiradentes Palace in Rio de Janeiro during a protest on June 17. 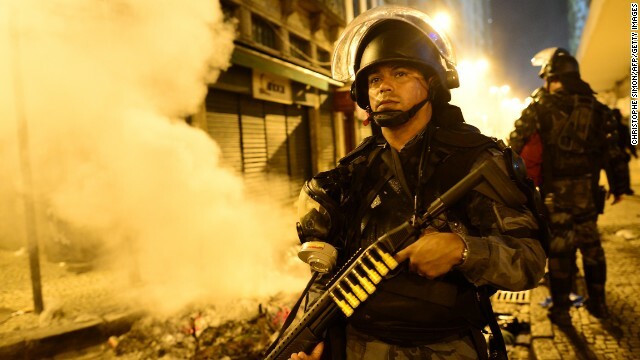 A riot officer holds a position in downtown Rio de Janeiro on June 17. Thousands participate in the protest in Rio de Janeiro on June 17. Piles of trash burn in the streets of Rio de Janeiro on June 17. 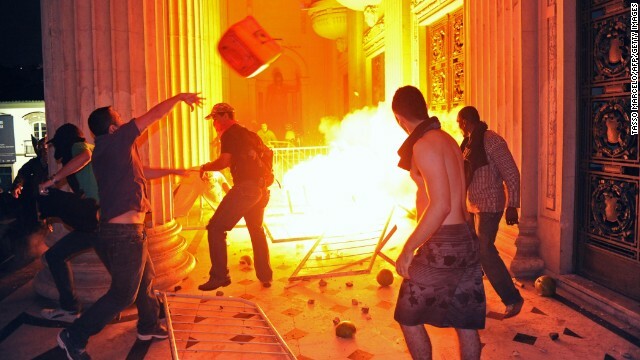 Protesters clash with riot police in front of Rio de Janeiro's Legislative Assembly building on June 17. 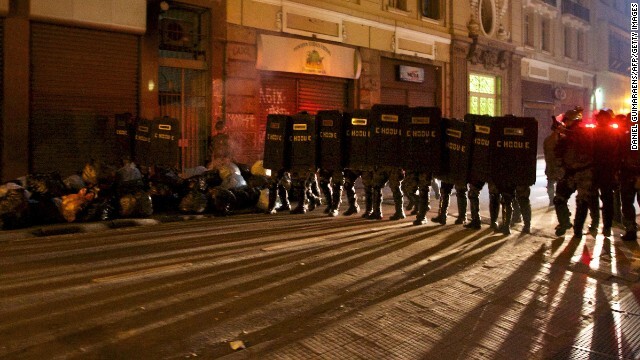 Protesters clash with riot police on June 17. A riot police officer receives help after clashing with protesters on June 17. 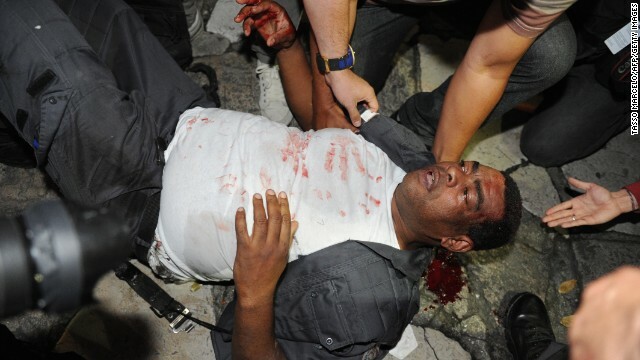 A protester receives assistance after being shot in the leg in Rio de Janeiro on June 17. 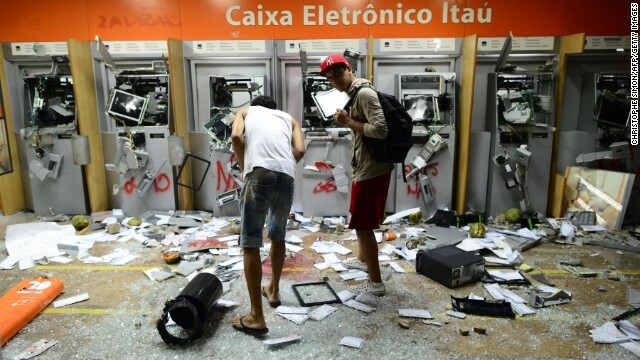 Two men look at smashed ATMs in Rio de Janeiro on June 17. 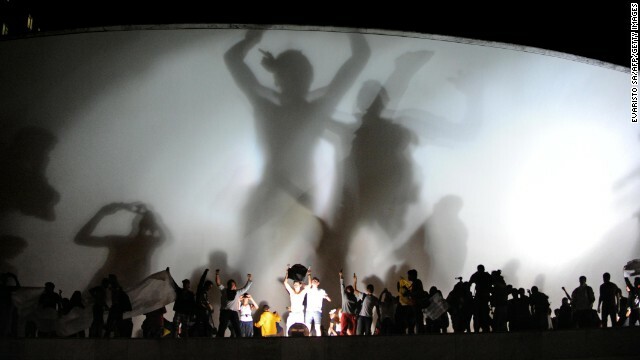 People stand atop the National Congress building in Brasilia, Brazil, on June 17. 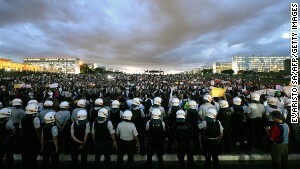 Thousands stand in the gardens of the National Congress in Brasilia during a protest on June 17. Large demonstrations in Rio de Janeiro, Sao Paulo and Brasilia came a day after a movement that started as a protest against a 9-cent increase in bus fares scored a major victory. Both Sao Paulo and Rio de Janeiro agreed to roll back the prices on bus and metro tickets. The movement has galvanized people across the country who say they're fed up with high taxes and a lack of services -- such as health and education -- while the government spends billions on preparations for the 2014 World Cup. 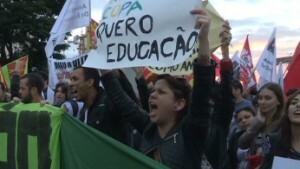 In Rio de Janeiro on Thursday, protesters held signs saying, "I'd swap 10 stadiums for one decent hospital in this country" and "I'd give up the World Cup for better education in my country." "Fundamentally, people are on the streets because they have very different demands, but they don't have a forum for expressing them and for being heard. And the bus fares were just one of these many many different things," said Alessandra Orofino, one of the protest organizers. Orofino said she hoped this week's protests will mark a turning point in Brazil, where democracy is still relatively young. "I think that what government hasn't understood is that there will be no single demand that will calm people down, per se. I think fundamentally, if they don't open up, if they don't become more transparent and truly welcoming of participation, people will continue to demonstrate," Orofino said. "It might be for now. It might be in the future, but this isn't going to go away until we have a democracy that works." Whom does the World Cup benefit? Protesters say the poorest are being short-changed while the government spends the large bills on new stadiums and glitzy infrastructure for the soccer competition Brazil is hosting next year and the Olympic Games coming in 2016. They complain that corruption is driving up the costs. Brazilian protester: Where do taxes go? The country's investment in those projects includes money for health and public transportation, Deputy Sports Minister Luis Fernandes has said. "There is absolutely nothing contradictory between organizing a World Cup and investing in health and education," he said. An elite National Force, made up of specially trained firefighters and police officers, will deploy to states hosting the games, the Ministry of Justice said late Tuesday. The government has stressed that the force's mission is to mediate and not repress. Brazilian President Dilma Rousseff told peaceful protesters Tuesday that their message was being heard. She praised them as active participants in democracy and said her government is committed to "social transformation." Police for the most part stood back, and the atmosphere grew festive and loud, with throngs singing and beating drums. Hidden in the peaceful multitudes were bands of rowdies who kicked down doors and broke windows, looted shops and tipped over cars and set them on fire. They left a trail of rubble down the protest routes. While asking police to back off from peaceful protesters, Rousseff has condemned "isolated and minor acts of violence," telling police to confront them "with vigor." In light of the protests, the Brazilian president has postponed a trip to Japan, the state-run Agencia Brasil news agency reported Thursday. Rousseff had been scheduled to travel to Japan on June 23-28, the government news agency reported, citing the president's communications secretary. A new date for the trip has not been announced, Agencia Brasil said. 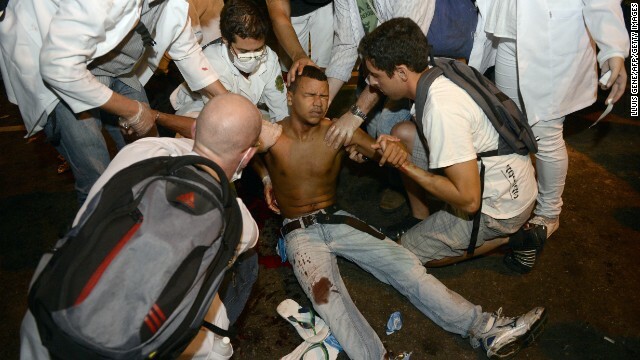 For nearly two weeks, tens of thousands of Brazilians marched through the streets night after night. Crowds originally protesting bus fares grew into multitudes decrying social injustice on Tuesday, as broad avenues filled to capacity for blocks. The protests come amid the soccer Confederations Cup tournament, a friendly array of matches, in which the host country, Brazil, plays against a small group of national teams from around the globe. The cup serves as a precursor to the World Cup. The majority of marchers are young and well-educated. Matheus Pires, a university student and one of the organizers, says public transportation should be free -- especially in expensive, sprawling cities such as Sao Paulo. "You can't go to hospital; you can't see your friends; you can't go to school; you can't go to work," he said, describing how much the city's residents rely on mass transit. Lowering fares, he said, would prove that the government was listening. But it's too soon to know whether it will bring an end to protests or fuel further and more far-reaching demands. CNN's Marilia Brocchetto reported from Rio de Janeiro. CNN's Shasta Darlington reported from Sao Paulo. CNN's Catherine E. Shoichet, Gabriela Matute Urdaneta, Mariano Castillo, Michael Pearson and Ben Brumfield contributed to this report. Tear gas, fires and running. 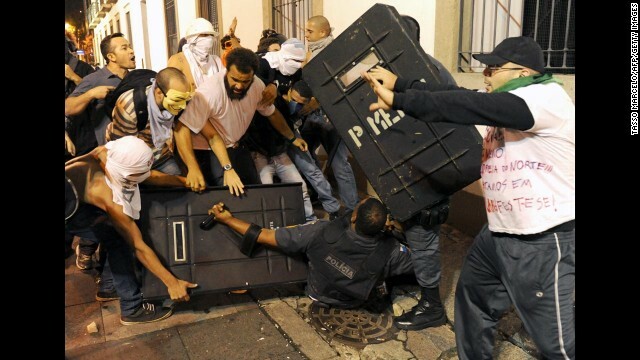 This shocking footage shows protesters clashing with police in Rio de Janeiro, Brazil. 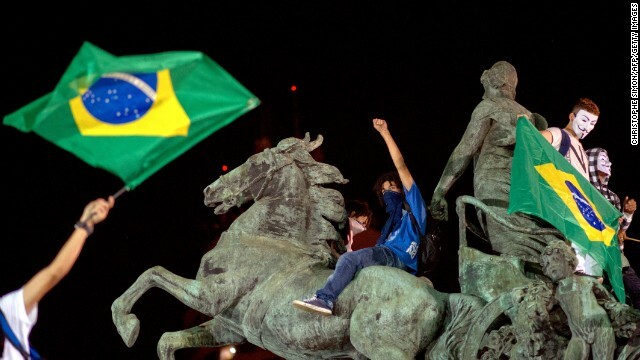 Why have protests gained traction at a time when Brazil is supposed to be celebrating? Rogério Simões explains. Despite bus fares being lowered, thousands of Brazilians are still marching in the streets. Shasta Darlington reports. 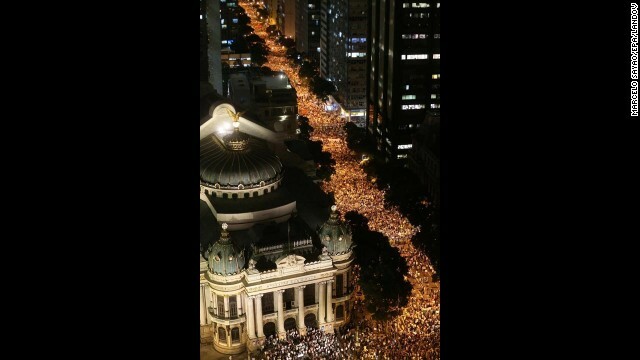 Hundreds of thousands fill the streets in major cities across Brazil. CNN's Matthew Chance reports. Video: Who are the protesters? CNN's Max Foster speaks with Alessandra Orofino about exactly who the Brazilian protesters are and what they want. 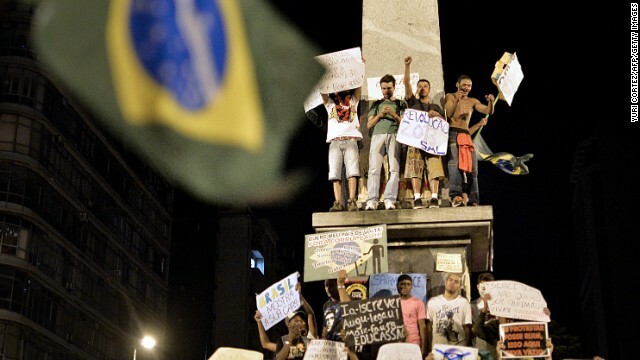 CNN's Shasta Darlington looks at who is participating in Brazil's protests and why. Brazilian foreign minister tells CNN's Christiane Amanpour that the protests are just a part of the democratic process. 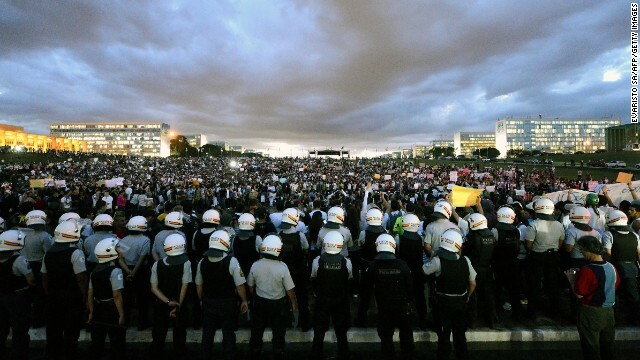 Brazilians head back to the streets to protest against the government. CNN's Shasta Darlington reports. Federal government says it will deploy an elite security group of firefighters and police following cries for social justice on streets of Brazil. Brazil has witnessed its largest protests in 20 years as citizens, struggling to meet rising living costs, revolt against the World Cup. Video: Where do taxes go? While protests tear through Brazil, CNN's Max Foster speaks with a citizen protester and a government official. 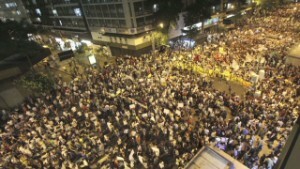 Another night of protests in Brazil, with demonstrators calling for a government more responsive to Brazilians' needs. Shasta Darlington on how a tiny price hike protest has snowballed into protests over a myriad of economic issues.